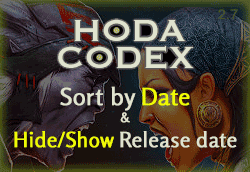 The Hodacodex continues to evolve and improve with the release of Version 3.5.
hodacodex.com now offers all the gears and all the heroes in a single interface. 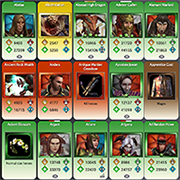 You can now view the Artwork of character tier progression directly on the hero’s card, a new symbol appeared in the bottom right. HodaCodex теперь доступен на русском языке. 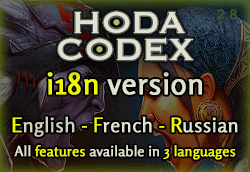 Another step is reached and the HodaCodex is now available in Russian. – Sorting by date is now available ! Another way to see the Heroes ! 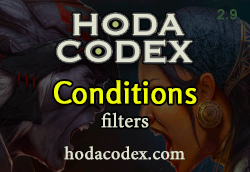 – A new button appears in the filters panel to show/hide the release date directly on the Hero card. You can now see the release date in the description for each Hero in the database. It was made possible thanks to The Queen of the Dragons: GameOfJones. 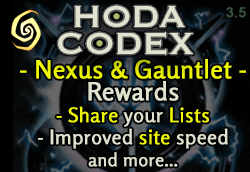 HODA CODEX: How to use Lists ? By default, when you click hero’s name, you add him to your My Heroes list. He is selected and his name turn yellow. 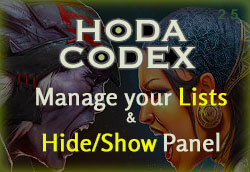 The Hoda Codex is changing and now offers Lists management. 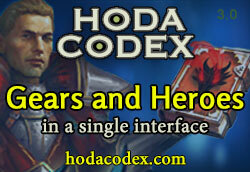 You can create custom lists of heroes and save, export or import them with a simple copy / paste.